When choosing a film to see, the lead actor often plays a major part in cinemagoers’ decisions. Lead actors take up much of the screen time, and thus their performances greatly influence how much the audience enjoys the picture. In rare cases, however, the main narrative can have less impact than the overall atmosphere of the film and the subplots. Director Choi Kook-hee’s drama “Default” is one that exceeded expectations in unexpected aspects. 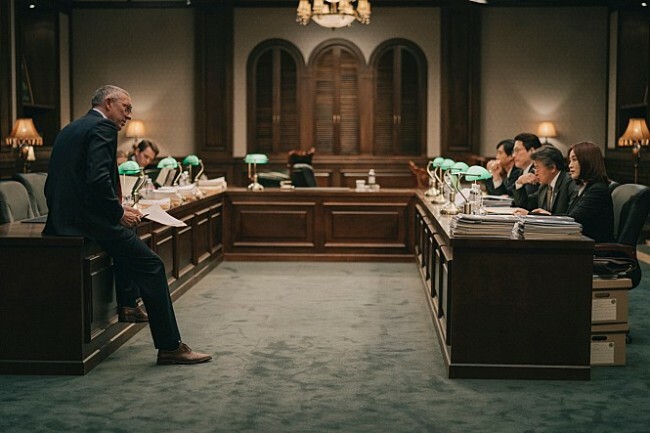 The film takes us back to 1997, to the eve of the worst financial crisis in Korea’s history. Han Shi-hyeon -- a senior analyst at the Bank of Korea, played by Kim Hye-soo -- foresees the pending crisis and warns senior government officials responsible for finance and the economy. The bigwigs take note of the situation, but her call for immediate action and the need to alert the public falls on deaf ears, as the high-ranking officials are more focused on covering everything up. Embodying this sentiment is the vice minister of finance, played by Jo Woo-jin, who sees an opportunity to restructure the entire country as he sees fit. Another opportunist is Yun Jeong-hak -- a brilliant banker-turned-investment consultant played by Yoo Ah-in -- who accurately predicts that the economy will crumble within days, and sees the pending crisis as a chance of a lifetime. Meanwhile, Gab-su, a father of two and owner of a small factory played by Heo Joon-ho, is happy that his factory has finally struck a deal to supply a department store. He is completely oblivious of the hell about to unfold. The main plot involves the real-life bailout negotiations between the Korean government and the International Monetary Fund, while the subplots are twofold: One centers on Gab-su and his struggle for dear life in the face of disaster, and the other on Yun’s mission to get rich while everything falls apart. The second act, where things start to get serious, is easily the most powerful moment of the movie. As a child at the time, I never understood the concepts of “default,” “bailout” or “bankruptcy,” but I was genuinely worried that the country was going down. Seeing it unfold on screen was a surreal experience, fueled by the fact that my parents, relatives and many people I know went through that hell on earth. Heo’s performance, his denial that everything he ever worked for could disappear in a puff of smoke, was far too real and too strong. But the part that was supposed to be the highlight of the film failed to take off. It is not my intention in this review to evaluate the effectiveness of the economic restructuring that the IMF forced upon the country. Many Koreans blame the process for the social problems that ensued -- including the chronically high unemployment rate and the hostile takeovers of local companies by foreign capital. So it is not surprising to see the film assume a critical tone toward the organization and the restructuring process. One thing that was annoying was Han’s method of addressing this “evil” -- let’s just go with it. Throughout the film, she is depicted as a strong-willed, intelligent person with a no-nonsense attitude and utter disregard for the sexist remarks of her idiotic superiors, who think women are “too emotional.” She is far more capable than any of the sexist men ordering her around. And what does she choose to do? Give a big, threatening, emotional speech to a man with all the cards. Why? Han is capable of gathering more proof for a more effective countermove, which she does later on in the film. But this was the problem. In a bid to create a traditional “good versus evil” structure, the negotiation process is oversimplified and overdramatized. Of course the IMF did not have Korea’s best interests at heart, but the situation was a bit more complicated than the way it was depicted in the film. With an actor of Vincent Cassel’s status playing the role of the IMF’s managing director, I imagined the role would have more depth. I don’t blame the French actor, though. His performance was quite good, but the character was written as a one-dimensional villain. Kim’s acting -- while not eye-popping -- is passable. Yoo Ah-in’s character, however, was very confusing. It is unclear where the director or the actor was going with his character. His mixed feelings about getting rich off other people’s misery seemed to herald a turning point in his character development, until it dissolved into nothingness. The supporting actors leave far more of an impression. Any scene with Gab-su had me invested right away, and Jo as the vice minister was ultrarealistically malicious and slimy. The issue with the film is that that it tackles socially relevant issues that still exist today, but it was extremely overemotional in its approach. This makes it hard to become fully immersed in the action. One thing the film was right on about was the rampant sexism, which was far more blatant in the 1990s. The third act, though, was the most disappointing. I know the film wants to deliver an important message, and some of it gets through. But just hammering it in is never an effective method. Overall, I see what the movie is trying to say and want to get onboard on some level. But the message is much too forced, multiple narratives are jumbled and the performances of the leads are not that strong. “Default” hits local theaters Nov. 28.